UPDATE:"Leaked" expansion memo is a fake. Got some juicy stuff and a .RAR filled with information about the new World of Warcraft expansion. 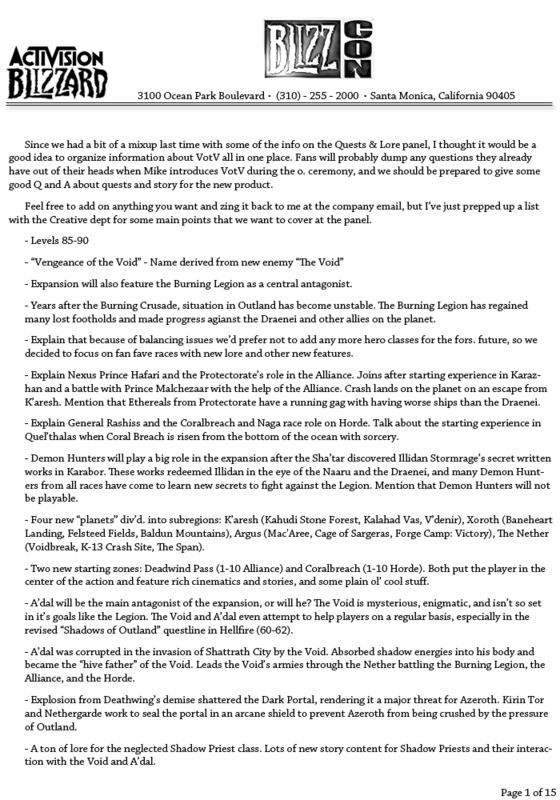 Got a hold of some kind of memo from a Blizzard conference or email about the expansion titled, "Vengeance of the Void" with some key points and information for reference for (Metzen?) at the Quests and Lore Q&A at Blizzcon 2011. I've reproduced the note in it's entirety in text form below in case the image is taken down or rendered inaccessible due to a bandwidth issue. Since we had a bit of a mixup last time with some of the info on the Quests & Lore panel, I thought it would be a good idea to organize information about VotV all in one place. Fans will probably dump any questions they already have out of their heads when Mike introduces VotV during the o. ceremony, and we should be prepared to give some good Q and A about quests and story for the new product. Feel free to add on anything you want and zing it back to me at the company email, but I’ve just prepped up a list with the Creative dept for some main points that we want to cover at the panel. - Expansion will also feature the Burning Legion as a central antagonist. - Years after the Burning Crusade, situation in Outland has become unstable. The Burning Legion has regained many lost footholds and made progress agianst the Draenei and other allies on the planet. - Explain that because of balancing issues we’d prefer not to add any more hero classes for the fors. future, so we decided to focus on fan fave races with new lore and other new features. - Explain Nexus Prince Hafari and the Protectorate’s role in the Alliance. Joins after starting experience in Karazhan and a battle with Prince Malchezaar with the help of the Alliance. Crash lands on the planet on an escape from K’aresh. Mention that Ethereals from Protectorate have a running gag with having worse ships than the Draenei. - Explain General Rashiss and the Coralbreach and Naga race role on Horde. Talk about the starting experience in Quel’thalas when Coral Breach is risen from the bottom of the ocean with sorcery. - Demon Hunters will play a big role in the expansion after the Sha’tar discovered Illidan Stormrage’s secret written works in Karabor. These works redeemed Illidan in the eye of the Naaru and the Draenei, and many Demon Hunters from all races have come to learn new secrets to fight against the Legion. Mention that Demon Hunters will not be playable. - Four new “planets” div’d. into subregions: K’aresh (Kahudi Stone Forest, Kalahad Vas, V’denir), Xoroth (Baneheart Landing, Felsteed Fields, Baldun Mountains), Argus (Mac'Aree, Cage of Sargeras, Forge Camp: Victory), The Nether (Voidbreak, K-13 Crash Site, The Span). - Two new starting zones: Deadwind Pass (1-10 Alliance) and Coralbreach (1-10 Horde). Both put the player in the center of the action and feature rich cinematics and stories, and some plain ol’ cool stuff. - A’dal will be the main antagonist of the expansion, or will he? The Void is mysterious, enigmatic, and isn’t so set in it’s goals like the Legion. The Void and A’dal even attempt to help players on a regular basis, especially in the revised “Shadows of Outland” questline in Hellfire (60-62). - A’dal was corrupted in the invasion of Shattrath City by the Void. Absorbed shadow energies into his body and became the “hive father” of the Void. Leads the Void’s armies through the Nether battling the Burning Legion, the Alliance, and the Horde. - Explosion from Deathwing’s demise shattered the Dark Portal, rendering it a major threat for Azeroth. Kirin Tor and Nethergarde work to seal the portal in an arcane shield to prevent Azeroth from being crushed by the pressure of Outland. - A ton of lore for the neglected Shadow Priest class. Lots of new story content for Shadow Priests and their interaction with the Void and A’dal.